[Vista] What does Vista do when it Sleeps? I have to say the new "power button" which puts Vista into the new "Sleep" mode seems nice. My 2 Ghz laptop (which doesn't have much on it yet I must admit) goes to sleep in 1 second and starts up in pretty much the same time. Superfast - I like it. As I understand it, by default a laptop is put into sleep mode when the power button is pressed, then goes into hibernate (saves memory to disk) after a few hours or so, to save power. When resuming from hibernate it takes a bit longer for the box to get going, but that's understandable. It's possible to configure what happens when you press the power button or close the lid, also depending on if you're on battery or plugged in. You can read more of what Vista does when it's in sleep mode on the Microsoft Vista Performance pages. Check it out - Nikhil also got a video to explain how it works. If you use <P> inside the quote, you may get additional quote signs, so use a couple of <BR /> instead. [Vista] Is Sami the Default Swedish Language? There were actually 3 different Sami dialects available; Lule, Northern and Southern, which is amazing in itself. I had no idea we had all these different versions of the Sami language... I can't remember seeing Finnish in that list though, but it should be. EDIT: There still (day after release) seems to be a problem with generating license keys for any other Vista version than the premium home edition. I guess we'll have to check back on the MSDN Subscription page every now and then and see if it gets fixed. My mate Eric blogs about how useful Anonymous Methods could be when calling on multiple asynchronous methods. Check it out. If you are a .NET developer, one of the most exciting features of Oracle Database 10g Release 2 for Windows is the ability to implement stored procedures using the .NET language of your choice, via Oracle Database Extensions for NET. I think I have to try this out some time. There are 100's of macros and add-ins and plug-ins doing this, but I got this one from "CodingHorror" installed and configured an ALT-C shortcut to copy the code as HTML. It's a manual installation process, but it's good enough for me. But overall I'm increasingly positive about using Ruby for serious work where speed, responsiveness, and productivity are important. Personally I've managed to install Rails and went through some tutorials. Not enough for me to give it a verdict. If you end up having a zillion files opened in the VisualStudio 2005 IDE and want to close a few of them, just click with the MIDDLE mouse button on their tabs where you see the filename. Quick and easy. You may want to look at the "Atlas" Control Toolkit site where they have a list of cool samples of what you can do with it, and it's dead simple. You can probably live without some of the controls, but some of them are quite useful and you would have to spend quite some time to achieve the effects you get for free. My favos on that list are the CollapsiblePanel and the TextBoxWatermark. Some may argue that these controls have nothing to do with Ajax, but Ajax has become synonymous with a rich UI, and this is what "Atlas" gives you for sure. More control over assembly naming and output. Custom pre-processing and post-processing for the build. The ability to exclude, add, and transform files and directories during builds. The ability to modify the Web.config file to change database connection strings, application settings, or the URLs for Web references, depending on the build configuration. (For example, it might be necessary to use different values for development, test, staging, and release settings). This white paper describes a solution to these advanced scenarios and introduces a new feature called Web Deployment Projects for Visual Studio 2005. ASP.NET 2.0 precompilation as part of the build process. A single assembly for the entire Web site. One assembly per content folder. A single assembly for all UI components. 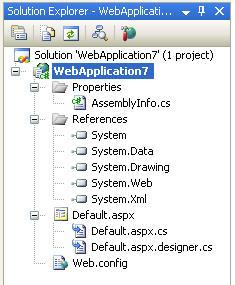 An assembly for each compiled file in the Web site. The ability to define custom pre-build and post-build actions. The ability to exclude folders from the build. The ability to modify settings in the Web.config file, such as the <connectionString> element, based on the Visual Studio build configuration. Support for creating .msi files with setup projects. The extensibility of Web Deployment projects enables you to tailor the build and deploy process to suit your needs. This is done without sacrificing the optimized workflow improvements achieved with Visual Studio 2005 Web site projects. I still have to read the whole page myself and try out the add-in. Looks interesting and useful though. Being intrigued by the provider system, I though I would spend some time on the excellent Provider Toolkit page on MSDN to see if I could understand how to write your own provider. From scratch that is, not based on the membership stuff. I found this great page, which describes how to write an SqlImageProvider from ground up. The sample code on the page got some errors in it, but I got it working eventually, and it's just amazing. I'll write another really simple provider and post the code here soon. Basically, if you place a file with this name in the root of a web application directory, ASP.NET 2.0 will shut-down the application, unload the application domain from the server, and stop processing any new incoming requests for that application. ASP.NET will also then respond to all requests for dynamic pages in the application by sending back the content of the app_offline.htm file (for example: you might want to have a “site under construction” or “down for maintenance” message). This provides a convenient way to take down your application while you are making big changes or copying in lots of new page functionality (and you want to avoid the annoying problem of people hitting and activating your site in the middle of a content update). It can also be a useful way to immediately unlock and unload a SQL Express or Access database whose .mdf or .mdb data files are residing in the /app_data directory. Once you remove the app_offline.htm file, the next request into the application will cause ASP.NET to load the application and app-domain again, and life will continue along as normal. You may want to read all the comments to this blog entry, some interesting conversation there. I just happened to stumble upon this feature when I was publishing my web app directly from within VisualStudio (Build->Publish...), because VS automatically places that file in the web app during upload of the new files. Neat. What is not so neat is that VS didn't remove the app_offline.htm file once it was done publishing :) Maybe it was because I was publishing to an FTP site... not sure. Will try again some other time.